Binary options trading is a growing industry, one with plenty of binary options brokers for virtually any type of option trader in the market today. From advanced binary options platforms to easier to use platforms that cater to beginners, binary options trading is easier now than ever before. Update: As of Jan 2017 Banc de Binary does not accept new clients. We advise you to sign up with 24option! 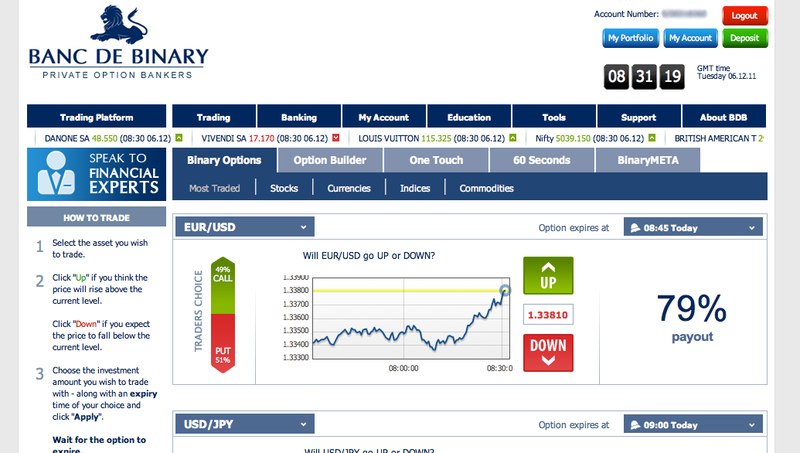 Banc de Binary is one of the more established binary options brokers in the market. Established in 2009, Banc de Binary claims to offer professional trading services provided by a team of experienced traders, investors, and financial analysts. We will cover the features that this binary options website offers to the average option trader and discuss how well it handles anything from stock options to forex options and beyond. As you can see, there is a wide selection of assets available. Banc de Binary offers plenty of choices, and their asset index is one of the broadest in the business – especially if you are looking for some pretty obscure options. Creating an account is very simple; all you need to begin is your name, email address, and telephone number. You can choose between EUR, GBP and USD for your currency of choice. Identification documents are not needed to start trading but may be required to withdraw funds from your account. Banc de Binary does not charge commission or broker’s fees, they make their profit from the difference between successful and unsuccessful binary trades. The maximum payout is 88%, and the refund for out-of-the-money trades is 15%, above average for the industry. The following tab is for the Option Builder which enables traders to pick the underlying asset, expiry time, investment amount and payout percentage they want and execute trades. Afterward, you can access the One Touch options tab which displays contracts for assets in which the payout condition is that the asset much “touch” a specific value above or below its current price at any time before the expiry in order to payout. The next tab is the 60 Second Options tab which allows traders to execute binaries based on 60-second expiry times. This is a great feature if you expect impending volatility on a specific asset. You can enter in ultra short-term trades on it to profit from the immediate movements. BinaryMETA is Bbinary’s in-depth charting feature which gives investors more historical trading data on the financial assets they seek to speculate on. This interface also enables traders to close out executed binary trades that are either in the money or out of the money before the expiry time if they so desire. Banc de Binary will also give you a list of most traded assets, so you can see what is popular and trending for the day with traders. Banc de Binary recently introduced a new feature called pair options whereby investors can speculate on which of two similar assets will perform better on a given trading day. For example, one can invest in a contract that stipulates that the price of a share of Facebook stock will rise in more relative value than a share of Google stock by end of the trading day on the New York Stock Exchange. If the prediction is realized, the contract pays out 80% of the amount invested, for example. These pair options are yet another alternative way to trade financial assets with potentially high rewards and limited risk. 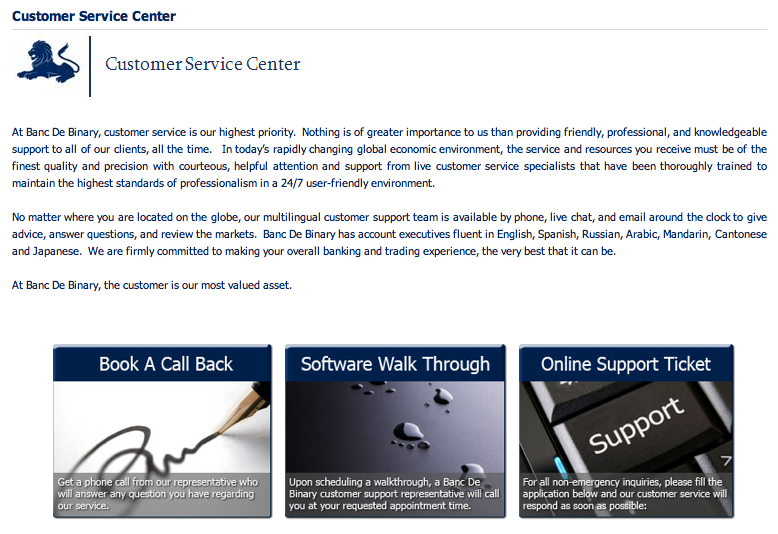 Banc de Binary offers one of the better customer service support systems in the market. The representative we spoke with for this review was courteous, knowledgeable, and prompt. They offer a software walkthrough, online support ticket system, call back services, and an online chat system as well as an extensive VIP program. All in all, Banc de Binary became popular because it is user-friendly, capable, and reliable. It is clear that this broker is one of the best in the business with one of the largest client bases. The broker’s website could benefit from a few more advanced trading tools and a better integration of charts and graphs into the trading platform. However, overall Banc be Binary is one of the safer places for traders to invest their money given their strong track record.